Tyler Foerster is a man of many talents, just one of which happens to be football. While football is Foerster’s current passion, he’s played multiple sports, including basketball, dodgeball, kickball, softball, soccer and more. Foerster has been involved in the National Gay Flag Football League (NGFFL) for six years, and not just as a player. He has coached for four years and has also been on three tournament committees as he makes his way up the NGFFL ladder. He hopes to join his local league board and eventually land a seat on the national board. “I plan to be involved with this league for a long time so the sky’s the limit,” he says. 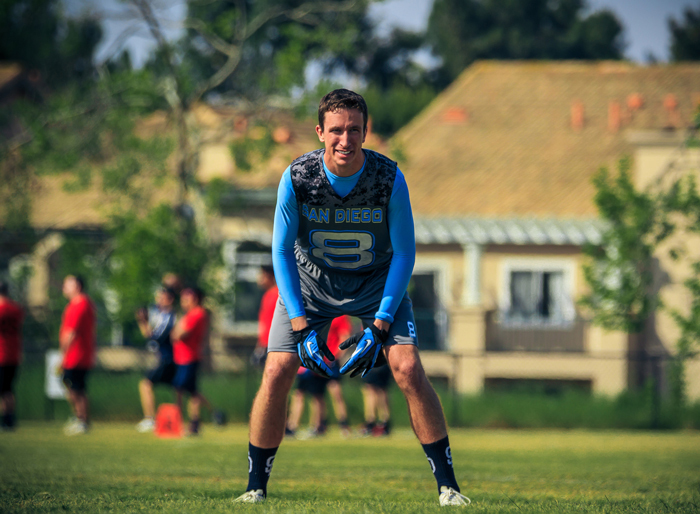 Originally a member of the Chicago Freeze, he has played for the San Diego Bolts most recently, this year’s Gay Bowl reigning champion. In addition to the Bolts, he is the captain of the San Diego Seals, a team that competes in smaller tournaments throughout the year. But Foerster knows how special the Bolts are, first realizing that when he saw them compete in Denver Gay Bowl XII. “The athleticism complied on this squad is truly amazing but even more important is the camaraderie between team members,” he said. Claiming that the San Diego American Flag Football League (SDAFFL) is more like his family, Foerster admits that he really roots for the players on the other teams representing San Diego just as much as his own Bolts. That dedication to San Diego by was long ago confirmed when the former Chicago-resident commuted to San Diego every week from the Windy City to play an entire 12-week season in the SDAFFL. And it was that commitment that landed Foerster a coveted spot on the Bolts. “Last year’s tournament championship was the highlight of my NGFFL career. It solidified that all the travelling and hard work was worth every second,” Foerster said. Badly injured in February during Fort Lauderdale’s Sunshine Cup, he could have spent his off-time concentrating on his recovery. But instead of being just a sideline player, Foerster volunteered to coach a team, all while wearing a cast and using crutches. He has been rehabbing hard and claims that he will be ready for this year’s Gay Bowl which is being played in his very own San Diego. Foerster is more than just an NGFFL player, coach and tournament organizer. His love of sports goes beyond his commitment to flag football. He has developed a scoreboard system called the U.S. Gay Sports Network (USGSN). The USGSN began with a simple concept: keeping the scores of all LGBT-affiliated sports leagues in North America. Since its start in 2010, the network now consists of ten cities and as many as six sports. This Gay Bowl in San Diego will be the 21st tournament USGSN will cover, and this year the USGSN is featuring live scoring throughout the tournament. USGSN is also introducing team pages for every team that has completed in the Gay Bowl since 2010. Always looking for more cities and leagues to join, each year the network continues to grow. In addition to his work at USGSN, Foerster has a very busy life outside of flag football. He enjoys traveling, seeing new places and meeting new people. He also has a passion for photography, film, web design and computer graphics. Most importantly, he enjoys spending quality time with his family, his partner of four years and close friends.